Whilst searching out the best Citroen H vans in Europe, we occasionally 'strike lucky' and find other little gems from the past. Not always French or Citroen but classic vehicles that appeal as well as, in our opinion, being very likely to appreciate in value in the future. Once again, any classic that we offer will always be a sound proposition, usually, but not always, immaculate (indeed sometimes needing full restoration) but there will be a good reason why we have chosen buy it. Rest assured that these vehicles were all purchased because of their rarity or because we fell in love with them! 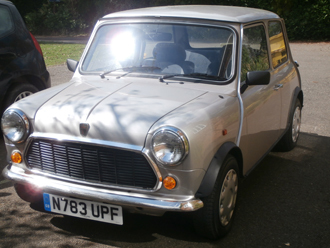 Just 400 of these 'special' hot Minis were allocated to the UK. Many have been used as track day cars or have been heavily modified. This car is totally standard, has service history, two sets of keys and all books. 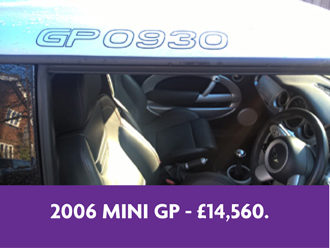 All the GP's were numbered; this car is number 930 and has covered just 57,000 miles. Superb condition and very exciting to drive! Unique “anthracite” speedometer & rev counter dials. 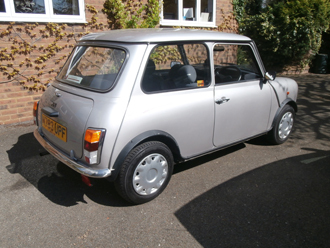 Just 400 of these 'special' hot Minis were allocated to the UK. Many have been used as track day cars or have been heavily modified. This car is totally standard, has service history, two sets of keys and all books. 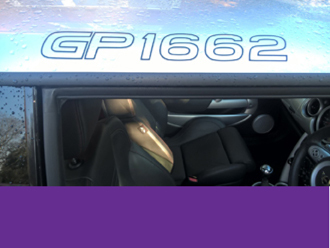 All the GP's were numbered; this car is number 1662 and has covered just 21,000 miles - possibly the lowest mileage example in existence! 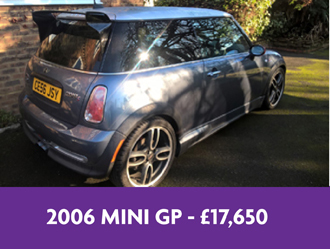 A real collector's piece - this car is as new, has its original sales invoice, handbook, two sets of keys, service history and all MOT certificates. The car has never been damaged and the interior and exterior are unmarked. A really lovely car which is literally of museum quality and a superb investment for the future. Try to find another! Just £10,870. So many memories! The sixties, the Prisoner, Twiggy, Carnaby Street......these cars really sum up the time perfectly! 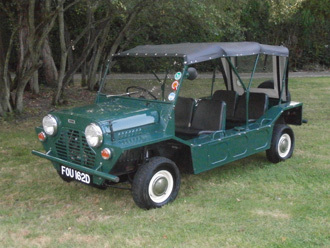 Original UK manufactured versions are the most sought after and this is one such example. 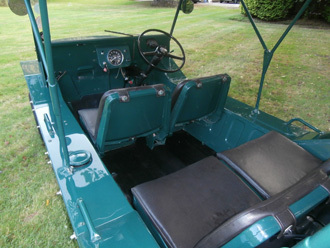 The car is in superb condition and has the extra two rear seats fitted. Lovely, even better if you have a house in the South of France or somewhere equally warm! £18,450. 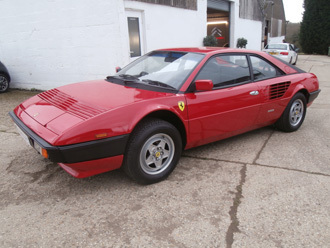 A lovely and very low mileage of one of the few Ferrari's that is still affordable. 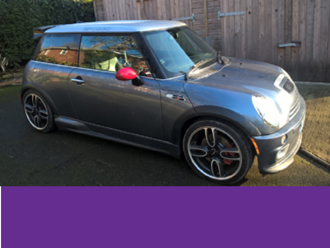 The car has covered just 22,000 miles during its life and the mileage is fully documented with service invoices and old MOT certificates. 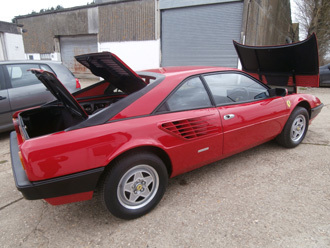 The QV, in very rare right hand drive form, is 'the one to have' when it comes to the Mondial. The car comes with its original handbook and keys. 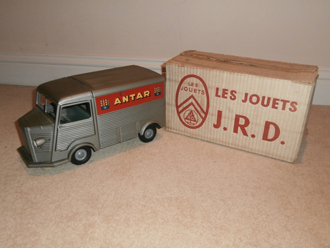 £35,780..
Les Jouets J.R.D. tin plate H van. 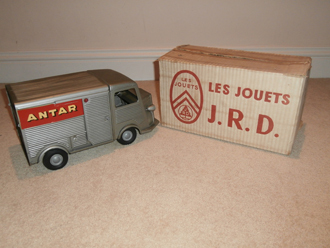 This is a very rare French model H van in any condition, but this example is not just in unused perfect condition, but it is also in its original cardboard box with the identification label still on the box. As such, this example has got model collectors very excited - tatty examples without the box sell for £500+ so this is cheap (and unrepeatable) at £1050. A very rare model.